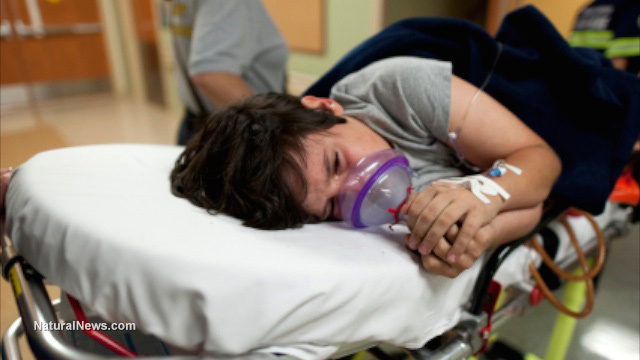 Did vaccines weaken immune systems of children now being hit by mysterious respiratory virus? (NaturalNews) A once-rare viral disease has reemerged and quickly spread to 46 states and the District of Columbia, infecting nearly 700 people, most of them children, over the past several months. And a common theme among those infected is that all of them were vaccinated, reports claim, including with flu vaccines that have been shown to weaken immunity and make people more prone to disease. According to the latest reports, nearly half a dozen individuals have already died from enterovirus D68, and another 10 have developed paralysis. As of this writing, there have been 691 confirmed cases of the disease across the U.S., according to the U.S. Centers for Disease Control and Prevention (CDC), with only Nevada, Arizona, Alaska, Hawaii and Puerto Rico not reporting any cases. Most recently, a 21-month-old baby girl from Michigan died from the infection, while several weeks prior, a four-year-old boy from New Jersey fell to the disease. There are also 17 cases of what The Dallas Morning News describes as an "unexplained neurologic illness" that a neurologist from the University of Texas Southwestern Medical Center says are probably linked to the disease. Though it comes from the same class of viruses as polio, enterovirus D68 is one of more than 100 non-polio viruses that can induce symptoms like mild fever, runny nose, sneezing, cough, and body and muscle aches. The CDC also says that enterovirus D68 can cause wheezing and difficult breathing, which in some severe cases may require hospitalization. "It can start just like a cold -- runny nose, sneezing, coughs -- but it's the wheezing you have to watch out for," said ABC News Chief Health and Medical Editor Dr. Richard Besser. Disease specialists tracking the spread of enterovirus D68 have noted that the virus only seems to be infecting people with a prior history of vaccination. Dr. Heather Ashton is quoted by The Daily Sheeple admitting this fact. "So far all of the reports we are seeing are coming in from children who have been partially or fully immunized," she stated. "Reports are managed through the National Enterovirus Surveillance System and the summaries thus far are all coming in from vaccinated pediatric populations in the U.S. and Canada." This is significant in light of a 2011 study published in the Journal of Virology, which found that influenza vaccines inhibit immune system function and make children more prone to disease. It was pro-vaccine researchers from Erasmus Medical Center in the Netherlands, in fact, who made this powerful discovery, which lends credence to the notion that enterovirus D68 is spreading because of vaccines. Flu vaccines, admitted reluctant lead author Rogier Bodewes, "have potential drawbacks that have previously been under appreciated and that are also a matter of debate." Though not actually polio, enterovirus D68 appears to trigger many of the same symptoms, including acute paralysis in certain parts of the body. Dozens of children are reportedly being admitted to the hospital with "floppy limbs," which CDC Deputy Director of the Division of Viral Diseases Jane Seward says are linked to the virus. "Acute flaccid paralysis, that's acute paralysis of parts of the body -- in this case the limbs, can result from a variety of viruses including polio virus and non-polio enteroviruses including enterovirus 68, West Nile Disease, echovirus and adenoviruses," she stated. "Most people who get enteroviruses have mild symptoms and no testing is ever done on them. I think we're looking at a rare outcome in these children," she added, affirming the hypothesis that weak immune systems, possibly caused by vaccines, are to blame.